Cobram manufactures a wide range of isodiametric drive tractors, the most practical of which is its RS model, which is available locally from Mirco Brothers . correct weight distribution on the axles with the machine under a working load. To ensure that operators can always choose just the right gear for every particular situation, the gears on RS tractors are always progressive, without overlaps. 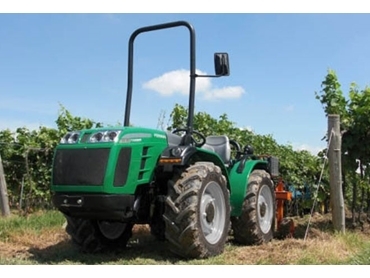 A single central joint allows the front axle of these tractors to oscillate by up to 15° with respect to the rear axle. The hydraulic system is double circuit, with an overall flow of 44 L/min and heat exchanger at working pressures of up to 180 bar.